Electric Scooters Starting At $549.99! Free Shipping With Purchase! If you want a versatile mobility aid vehicle with high top speeds and easy portability, we recommend looking into an electric scooter. Electric scooters are perfect for people with mobility impairments who don't necessarily need a wheelchair every minute of the day to get around, but could use a little boost getting around the neighborhood or need a lift when friends and relatives want to go on extended foot trips. 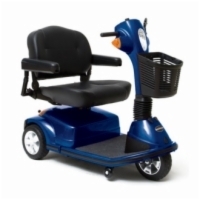 Choose from dozens of electric scooter models from industry-leading manufacturers like AmeriGlide, Golden Technologies, and Pride Mobility. Get a maneuverable 3 wheeled scooter or a stable 4 wheeled model. 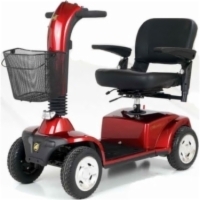 Enjoy mobility on the go with a portable travel scooter, or experience the superior performance of heavy duty electric scooters with a personal mobility vehicle by Pride or Golden! 3 wheel electric scooters include travel sized, standard size, and heavy duty models. Whatever size you choose, 3 wheel electric scooters offer more maneuverability than 4 wheel electric scooters due to their much smaller turning radius, which allows you to turn your scooter around in less space than would be needed for a larger model. 4 wheel electric scooters include travel sized, standard size, and heavy duty models. Whatever size you choose, 4 wheel electric scooters give you more stability than a 3 wheel model because they have a wheel at every corner of the scooter frame. If you need the extra stability or better handling over uneven surfaces, then choose a 4 wheel electric scooter. Travel electric scooters include 3 wheel and 4 wheel scooters that are compact and made to easily take along with you. Their portability can come from either a folding design or from a disassembling design that lets you separate the scooter into smaller parts for storage in your car, truck, or van. Extra batteries are also available, so you can keep a backup set fully charged and ready for use. Heavy duty electric scooters are available in 3 wheel and 4 wheel designs. 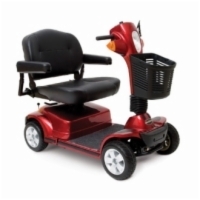 They are made with larger frames, bigger tires, higher-capacity batteries, and wider seats to comfortably fit users weighing 300 pounds or more. 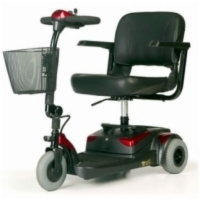 Even smaller users may benefit from a heavy duty electric scooter's ability to handle rough, uneven terrain and travel quickly over smooth surfaces thanks to their increased power and advanced suspension designs.